On the beach in Belize. TRAVEL — Belize is a country of about 350,000 people located east of Guatemala and south of Mexico. English is the official language. You can fly to the capital, Belize City, from Vancouver for about $850. I flew to Cancun for several hundred dollars less, rented a car and drove four hours to the Mexican city of Chetumal, which borders Belize. Unfortunately, it is not easy to drive across the border due to rules and regulations. You can take the ADO bus from Mexico to Belize, or from Chetumal you can take a 90-minute water-taxi to Ambergris Caye. You could also, walk across the border and take a taxi to Corozal airport in Belize, as I did. I was nervous leaving my car unattended, but was assured by the border guard that it would be fine as it was in plain sight of the border police. Who would try to steal a car right in front of them? I was told by the same border guard that I had to pay an exit fee when leaving Mexico, but did not believe this was true. I said that if it is required, then I would need a receipt. Moments later, I crossed the border having paid no fee. I walked across a bridge spanning the Hondo River and caught a taxi that took me to the Belize border office about a kilometer further; I cleared customs while my taxi waited to take me to the little airport. We drove about 15 minutes over some rough roads to a spot that makes the Kamloops airport look big. There were two shed-sized buildings, each housing the office of an airline: Maya Island Air and Tropic Air. I bought my return ticket for $67 USD per direction on a 12-seater plane to San Pedro on Ambergris Caye. The main reason for my trip was for travel agent training at Club Med in Cancun, but I decided to add a couple of days to quickly explore Belize. With only two nights, my plan was to spend one night in Ambergris Caye and another in Caye Caulker. The flight took only 20 minutes and provided some excellent views from above. As we touched down on the small airstrip I noticed a Scotia Bank beside the airport. After my wife had lovingly ordered some Belize dollars from the bank for me, I left them in my suitcase in the rental car as I switched to the more appropriate backpack for this part of my trip. ATM’s were easy to find and easy to use; the exchange rate is about $2 Belize to $1 USD. I wandered through town amid heavy traffic of golf carts – the preferred method of transportation on the island. I was offered a taxi-ride, but figured it would be easy enough to walk. I met a Bob Marley look alike on a bike who offered to show me the way to a good backpacker hostel. I followed the dread-locks along the beach, declined the offer to purchase some herbs and checked into the waterfront accommodation. A shared dorm room was about $20 CAD per night. I dropped off my backpack and explored the island some more, scoping out the water taxi dock for the next morning. I ate some excellent burritos from a vendor at the beach-side market and went back to relax at the Sand Bar. I met several people who were there for diving and snorkeling, but had their excursions cancelled due to strong winds. On a future trip I really want to go diving at the Blue Hole. In the morning, I boarded the water taxi. 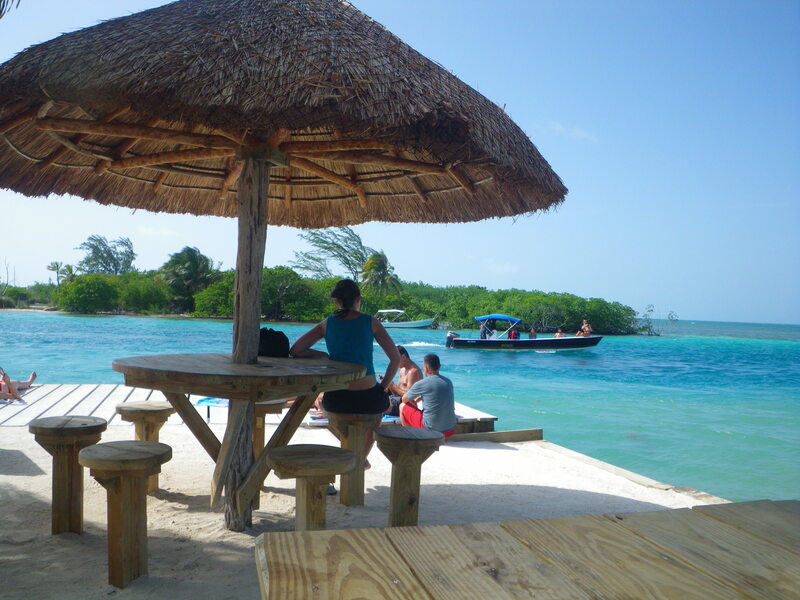 San Pedro Belize Express has several throughout the day for about $15 CAD per direction. You can also go to Belize City, Chetumal and other locations in Belize. The ride took about 30 minutes and provided more excellent views from the water. Upon arrival in Caye Caulker I saw several guest houses right on the beach next to the dock, the first one was sold out, the next one offered a bed in a tiny room with two beds for $15 USD including a full hot breakfast and a welcome drink of Rum Punch. Walking down the main road, I had one beach directly on my right and another a couple of blocks across the island on my left. Five minutes later I was at a place called the Split where there is a pub/restaurant with water on 3 sides, a narrow channel of brilliant turquoise water separating Caye Caulker from the next island. I spent the rest of the day chillaxing in paradise before starting the trip home the next day.